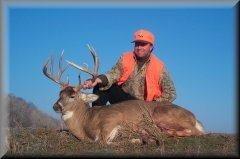 Hunting and fishing photo gallery taken by avid hunters and fishers. 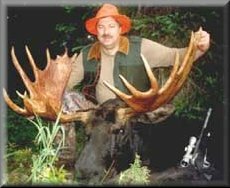 If you would like to post one of your Trophy pictures on Huntfind.com, e-mail us your picture and a short description. 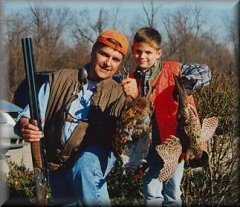 8-year-old Ben Badofsky (pictured here with his dad, Eric), showing off the results of his very first ringneck pheasant hunt (Three Oaks, Michigan 11/10/01). Note: when sending e-mail, if you are using a provider like AOL, Yahoo, or Hot mail, if you do not have a mail box system configured on your hard drive the email you send may not go through. In this case, go to your email account provider and send an email to info@huntfind and attach your file. A good Yellowstone Migration Hunt in Wyoming with John Henry Lee Outfitters. 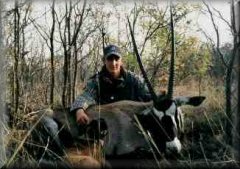 I took this Bull in the Northern parts of South Africa while hunting Bushpigs and Impala with a bow.Rifle was a .303, the Staffie picked up the scent of the the downed Oryx in the thick Bushveld enabling me to find him late the same afternoon he was shot. 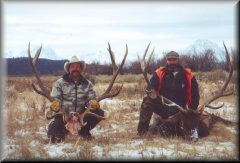 Copyright © 2000-2002 Huntfind Guides and Outfitters, Inc.